TRICKY JIGSAW: Flooding ripped up Karrabin-Rosewood Rd at Campbell's Gully. HOW many people does it take to repair a road completely destroyed by floodwaters within 48-hours? The answer - roughly 40 workers including inspectors and engineers, rushed in from the State Government's Main Roads Department. As the floodwaters brought by ex-tropical Cyclone Debbie receded across Ipswich, the scale of damage was revealed. Two roads in particular were near destroyed as huge volumes of water washed away road pavement. 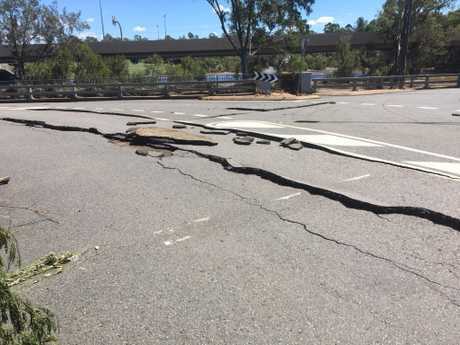 The damage was so severe that in the aftermath Ipswich City Council warned residents one section along Karrabin-Rosewood Rd would likely be closed for a month. 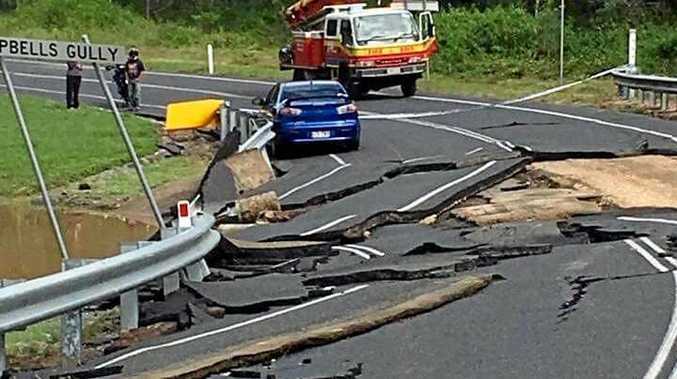 But the State Government swept in with an army of workers and within 48 hours the most damaged section of road at Campbell's Gully was reopened with a new surface. At Campbell's Gully crews from the Main Roads Department worked around the clock from late Friday night through to Monday morning, laying 285 tonnes of asphalt. 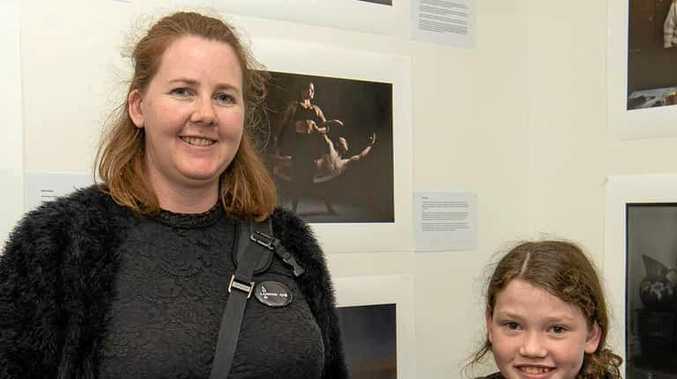 There were eight workers and four engineers on site over Saturday and Sunday, while 14 people worked through Saturday night before the line marking crew took over. Main Roads Minister Mark Bailey said the crews worked on rotating shifts around the clock to make sure the site was safe and could reopen on Monday morning, under reduced speed limits. "I want to thank the crews for working so hard," Minister Bailey said. "Floodwaters had washed away the road pavement on top of the culvert, along with downstream headwall, wing-walls and guardrails." Workers removed more than 150 cubic metres of damaged pavement and replaced it with 90 tonnes of gravel. Meanwhile as the road at Campbell's Gully reopened, the council set to work assessing damage at Lobb St on Monday morning. At 12.30pm the repair works began and by 9.30pm, after 119 tonnes of asphalt had been laid and the road declared safe, it was reopened to traffic. Ipswich West MP Jim Madden said repairs to the guardrail at Campbell's Gully would be finished later this month. Speeds are reduced along the stretch of repaired road while Main Roads assesses conditions to decide when the 60 kmh speed limit can be restored.